Orders received between Monday and Friday are processed within 1-2 business days. Once your item has shipped, we will send you another email containing the tracking number of your order. Some Melhart manufactured products are made to order and delivery time varies. Please call for delivery estimate. Very heavy (over 70 lb.) or oversized packages such as PA's, Cabinets, Drum Kits, and School Music Equipment, which are required to ship via freight are not included in Free Ground Shipping. Please call for details on freight charges for your particular item(s). Please see product description page or shopping cart. Valid only on shipments to Lower 48 states. At this time we do not currently ship internationally. Products that ship separately such as Drumsets do not qualify! As part of our commitment to customer service, Melhart Music Center offers a money back guarantee. If you are dissatisfied in any way, with a purchase from our website, you may return the item(s) for an exchange or refund within 30 days of purchase. All items must be returned in it's original condition. Your receipt, manual, and all original packaging are required for an exchange or refund. Please be advised that prior authorization is required on all returns. Any returns sent to us without a return authorization cannot be accepted. If returning an item(s), you must include all parts and pieces to be eligible for a refund. Also, to ensure that your returns are received, please make sure to add insurance to your parcels through a preferred mail delivery service. All returned itmes will be inspected and any deemed in a condition less than described will be assessed a 15% restocking fee. Order shipments that are refused are subject to a 15% restocking fee. Warranty does not apply to damage caused by common carrier, misuse or abuse, alterations to products not expressly authorized by Melhart, nor to components considered to be of a consumables nature such as bulbs, batteries, etc. 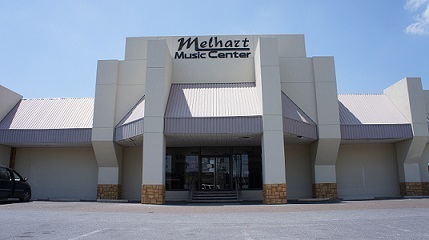 Melhart Music Center always strives for accuracy in the information and pricing we present. However, we are not responsible for typographical errors, incorrect specifications furnished by manufacturers, or for price changes. Prices are subject to change without notice. All transactions are handled by our server using Secure Socket Layer technology, certified by DigiCert. This encrypts the data that is sent to and from our servers. If you have further questions please contact us here at Melhart Music Center.